Many employers like to support the things that are important to you, their employee. 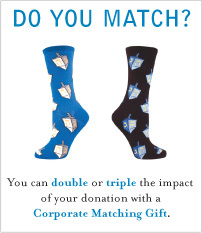 If your company has an employee matching gift program, you could double the impact of your gift to The Jewish Federation of Greater Santa Barbara. Check with your human resources or community relations department, and ask for the proper form to request that your company match your gift to the Federation. Check this list of 400 companies who do match gifts to Federation. Contact Michael S. Rassler at (805) 957-1115 if you have any questions about matching gifts.